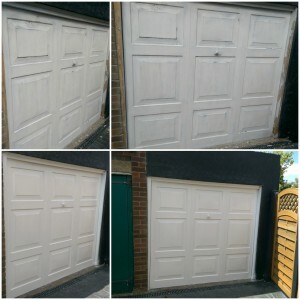 John of Chigwell, East London recently asked us qoute for his old garage door damages repair and full respray. Door was 10 years old and looked terible, old paint was peeling off, lots of chips scratches and grey marks. He was very happy when he find out that our service will cost him cheaper than new door, not even talking about replacement costs.. When John came back after work he thought Royal Repair specialists changed his old door, because they looked like brand new after full resurfacing.